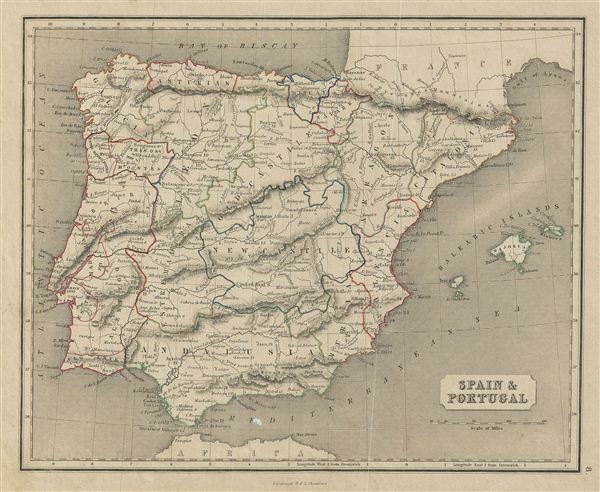 This is a fine example of the 1845 Chambers map of Spain and Portugal. The map covers all of Spain and Portugal from the Pyrenees to the Strait of Gibraltar and includes the Balearic Islands of Ibiza, Majorca, and Minorca. Divided and color coded according to regions and territories, the map identifies various cities, towns, islands, rivers, and an assortment of additional topographical details.